Go into any museum in Britain and you will most likely see an abundance of restored Roman pottery. The Romans were creative people which is apparent in the variety and intricacy of the earthenware they made. Pottery businesses were established to meet the ever growing demand for vessels of one sort or another. Many had their own designs and trademarks to show their quality. One such potter was Sextima who worked in Lezoux in Gaul around 150AD. It was considered a great talking point at gatherings and dinner parties when the host owned a work produced by a well established and distinguished craftsman. Pottery came in a variety of shapes, sizes and uses. From wine decanters to table sets, through to bedside oil lamps. If it could be made by a potter, it usually was. Even before the Roman invasion of 43AD., pottery was the number one imported item, even above food. This is evident by the remains found at archaeological excavations. Most of the pottery imported into Britain came from Gaul. Up to the invasion, the British made pottery, but it was of a lower quality than their Gallic cousins in Europe were producing, so hardly any was exported. The vast majority of pottery used in Britain was imported. Then the Romans arrived and the demand for pottery escalated to an astronomic level. 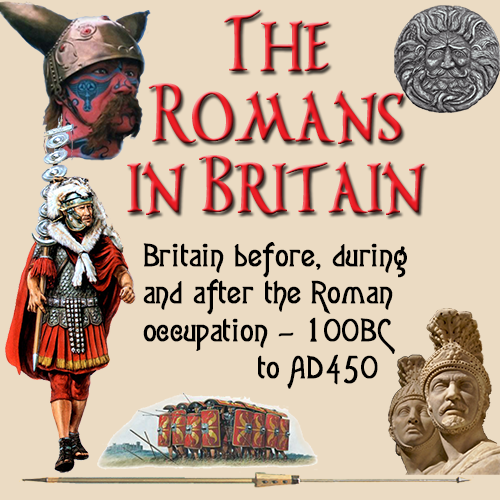 The Romans brought their own craftsmen, but the demand was still too high for them to cope with. Importing pottery for the Roman army was expensive. The transportation from Gaul alone added to the final cost of the product. It soon became clear that the British could turn pottery into a growth industry. There were some 50,000 Roman soldiers in Britain and business entrepreneurs saw that this was a chance to make a lot of money. The British wasted no time in learning new techniques from the Romans to improve the quality of their products to a level the Romans would accept. As the quality and diversity of their pottery increased, so did the British share of the pottery market. Earthenware became a much demanded product due to the changing style of life and potteries were founded all over Britain. As anything made of clay is inherently fragile, the market was in constant need of replacements due to breakage. Most pottery makers served the community in which they resided and the surrounding area. The workshops were quite small, but there were a lot of them. In a workshop there were three or four kilns, each holding up to 500 items in one firing. It was a never ending chain of work for the potter. As he moulded one batch of pottery, a previous one was ready to be taken from the kiln. As soon as the kiln was empty, it was refilled and restarted. There was no gas or electric, just a furnace under the kiln, a mass of firewood and several helpers working constantly to keep the kiln at the correct temperature. Pottery was produced in buildings built mainly of timber about 120ft x 60ft (37m x 18m) in size. The inside was divided into aisles with the kilns at one end of the building. These were large in construction, circular, made of brick and having an access door, stoke hole underneath and a chimney at the top. The production process was started by a team of craftsmen who formed the basic shape of the pot using clay from a mound outside. They would work in by hand until it was suitably pliable then they would throw it onto their revolving wheel and begin to mould the desired shape using their hands. The pots were then placed in a shed to dry. In summer the process was accelerated by putting them outside to let the sun dry them. When dry, they were taken inside to another part of the building where the designs would be added by hand and then they would have the various colours painted on. They were then passed onto the firing team, a group of men whose job was to undertake the exacting task of firing the clay to just the right temperature for a specified time. The pots were carefully arranged in the kiln to use up as much space as possible and to ensure that none fell over. If any did, it would have a domino effect and ruin most of the work. There could be up to 500 items in one kiln, such was their size. The firewood was placed under the kiln through the stoking hole. The top of the kiln was then covered with turf, leaving a gap to create a draught of air through the fire, into the kiln, pass the pottery and out the top. About three men would stoke the fire for the first 2-3 hours until the kiln was at it's utmost temperature. Once there it was necessary to keep it at a set temperature for the duration of the firing. The kiln would then fire everything inside and then be left overnight to cool. In the morning it would be opened and the contents removed, packed into crates and transported to the river ready for delivery. In time, certain potters became well known throughout the land and demand for their work escalated. To ensure their continued success, these potters began to copy their counterparts on the continent and sign their work or put brand marks on it. This made the goods they produced self promoting and their reputations grew as a result. An owner of one business (Albinus) had workshops at Radlett and Brockley Hill in the South East, north of Londinium. In the ten years from 90-100AD., he sold more mortaria (grinding bowls) than any other maker and his work has been found all over Britain as far as the Scottish borders. Eventually there were so many earthenware factories in Britain, that production eventually exceeded demand and many factories began to close. By the middle of the second century, potters numbers had dropped, but this was not the end. By a process of natural selection, only the best potteries survived and these mostly became centralised around one area. There were three factories at Churchill, Cowley and Headington In Oxfordshire the pottery industry was still alive and growing. The industry was aided in the third century by unrest in Gaul that led to the decline in the numbers of Samian products available. By now the British had built their technology to a degree where they could produce goods that were of equal quality to the Samian ware and copies of the Gallic designs began to be made in Britain. They were very good imitations, right down to the colouration. But they lacked one aspect. The British potters never managed to reproduce the classic finish that made Samian pottery so unique. Regardless of this, it still made a big impression and was found in the majority of homes at that time. Further South-West at Ashley Rails and Linwood in Hampshire a new factory was established that produced masses of cheaper pottery. The key to their business idea was to make large numbers of the most commonly needed items at a price well below the competition. They had the added advantage of rich deposits of clay and huge amounts of wood that could be taken from the New Forest. All these factors enabled them to make a success out of mass production. As technology improved, the style of pottery changed. By the late third century kilns had opened in Lincolnshire that were producing some incredible designs and colours. Pottery had come of age with the introduction of new techniques and materials used for colouring and glazing. The New Forest manufacturers developed their market by introducing new colours and designs to their range. Pottery now came in a variety of colours from deep yellows to bright reds, blues, greens and even purple began to appear. They became well known throughout the land mainly for their drinking vessels that had raised motifs in white against a dark colour-coated background. Potters in the Nene Valley also produced similar items, though their vessels had scenes rather than designs. Again the designs were on a dark background with white raised decoration depicting animals, images of hunting and painted scroll designs. The finest pottery of all was Samian pottery from Gaul. 'Samian' is said to derive from the island of Samos in the Aegean Sea. Samian products were noted for their vivid red colouration and intricate artwork. This pottery was stunning in the extreme and many methods were devised to show off the craftsmanship. One method used to emphasise the patterns was to have plain cups and plates alongside the stunning Samian pottery. This would enhance the patterns and make them more noticeable. To give some idea of the extent to which Samian ware was manufactured, a production record from an unknown date states that 34 potters in Southern France at La Graufesenque produced over 400,000 pots over just a few months. Much of this would have come to Britain, where it would have been shown in many houses, dining rooms etc. throughout the land. 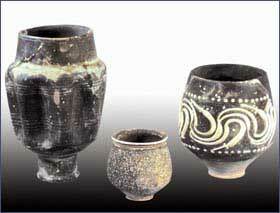 In the second and third centuries AD., pottery from the Germanic regions began to make an appearance. This ware was a stark compared to the strong red colour of Samian. It was almost metallic in appearance, which when placed with Samian pottery made for a most pleasing contrast in styles. The German pottery often had white markings and inscriptions. For example, a mug might bear the engraving 'Bibe' or 'Vita', the Roman words for 'drink' and 'life'.